Hello fans! 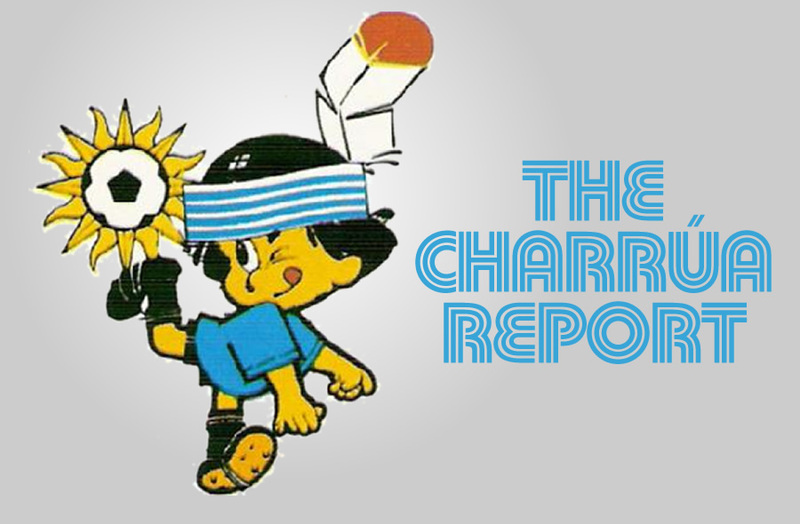 El Bolso is here with another edition of the Charrúa Report. League action is wrapping up around the world, and national teams are gearing up for the Copa América. Let’s get to it! I’m not going to lie, it will be weird watching the Celeste play in a major tournament without all fo those guys, but the changes were definitely warranted, and it’s good to see some new blood out there. As far as the players that did make the squad, I’ll have a full Celeste preview next week (since there won’t be much else to talk about). 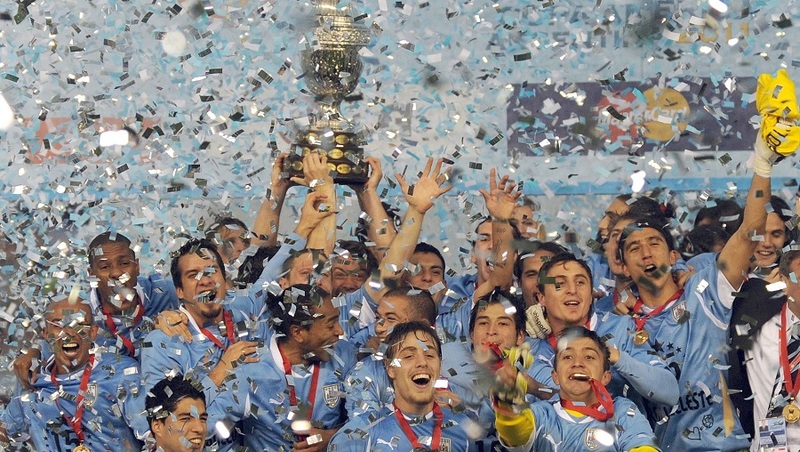 The 2015 Copa América begins on June 11th, and El Bolso will surely have plenty to say about it! Nacional lost to Cerro 1-0 this weekend, putting to rest any slim hopes they had of winnign the Clausura and avoiding an end of year playoff. The team looked pretty bad, which is understandable after the big Derby letdown last week, and was facing an opponent desperately trying to avoid relegation. Cerro played their hearts out, found a lucky strike early in the second half, and held on for a huge victory. Keeper Jorge Bava explained it perfectly after the game: “Cerro played as if it were a final, and we didn’t.” Now all that’s left to do is to get everyone healthy for the championship playoff. In other Clausura news, Danubio’s loss against humble Sud América makes this a two team race: Peñarol leads with 27 points after beating Rentistas 2-0, and river Plate (no, not the maced one) is second with 26. 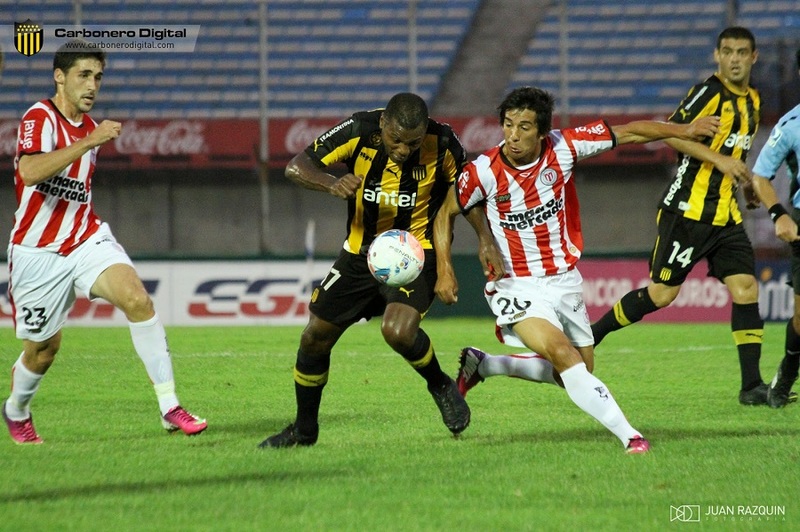 The next two weekends will determine which one of them faces off against Nacional. It was a very special weekend for River, as their 4-0 win against El Tanque Sisley clinched 3rd place in the Annual table and a spot in next season’s Libertadores Cup first round playoff (they can still pass Peñarol for 2nd and a direct ticket to the group stage). Nacional, of course, clinched first place long ago. As far as the fight for 4th-6th place (which come with Copa Sudamericana berths), Defensor Sporting and Racing are tied for 4th with 44 points, while Juventud and Danubio share 6th place with 43 points. One of those teams is going to be left out of the international tournament money, so it looks to be an exciting two weeks! Last and definitely least, the relegation battle is red hot. Tacuarembó’s loss to Wanderers means they will be going right back down to the second tier after a year in the top league. The other two spots are currently owned by Rampla Juniors (60 points) and El Tanque (66), but Atenas (66) and Cerro (68) are barely holding on to the safety zone. I should point out, however, that Atenas and Rampla have a big advantage: the relegation table is a two year composite, and since those two teams were promoted this past season, their 2014/15 season points count double for this purpose. So a win next week would get them 6 points instead of 3. Look, relegation is complicated in Latin America; just go with the flow. Tacuarembó and Atenas are 2 of only 3 teams from outside Montevideo in the premier division (Juventud is the other) so El Bolso would like to see Atenas survive to keep the non-capital representation as high as possible (Plaza Colonia already clinched a promotion spot this season, so there will be at least 2 teams). It was a quiet week for Suárez and Barcelona; the Blaugranas clinched La Liga last week, so they’re basically resting up and getting ready to go for the treble. El Pistolero is still nursing that injury suffered against Bayern Munich, but team sources say he will be ready to go for Saturday’s Copa del Rey final against Athletic Bilbao. After that, they will travel to Berlin for the June 6th matchup against Juventus. Suárez did get some goodnews this week, winning the prestigious EFE Trophy, given annually to the best Latin American player in La Liga (except in 2012/13, when Cristiano Ronaldo won it for some reason). Luis becomes the third Uruguayan to win the award, joining Forlán (2004/5) and José Luis Zalazar, who won it for the 1991/2 season, the second time it was given. Look, I’m as big a homer and Suárez fan as anyone, but aren’t there more deserving players out there? Perhaps, I don’t know, in the very same locker room? Uruguayans went crazy in France this weekend, with both Edinson Cavani and Diego Rolan scoring doubles. Both players are clicking on all cylinders right now, which is good news for Tabárez: this is his starting forward line for the upcoming Copa América. Cavani finished in 4th place in the Ligue 1 scorers table (18 goals), while Rolan came in 7th (15). Great job! Let’s hope they can keep it up this summer. Rolan’s spree came with historic connotations: Bordeaux played its first game at their brand new stadium, meaning that the Uruguayan has the first two goals ever scored there. He also has the last two goals scored at the old field, thanks to his double two weekends ago. Christian Stuani is still filling the net in Spain: the Espanyol striker scored his 12th La Liga goal, his best career total. Real Sociedad’s Chori Castro also scored this weekend, and also added two assists in a 4-2 win against Rayo Vallecano. Man, Castro really likes those volleys! SAUSAGE! SAUSAGE! Meanwhile, in Italy, Napoli’s Miguel Britos also left his mark… but not in quite the same way. Congratulations are in order for Uruguayan National Team keeper Fernando Muslera, who joined the title parade when Galatasaray won the Turkish League this weekend. The 1999-2000 UEFA Cup winners had a 3 point lead going into the final weekend and beat Besiktas 2-0 in their last match. It wouldn’t have mattered, though, as their closest pursers, Fenerbahce, was too busy getting 4 players sent off to win their game. Fenerbahce, of course, was home to “La Tota” Lugano for many years, and currently feature former Nacional striker and Cameroonian World Cup Squad member Pierre Webó (he’s the guy practicing his Sweet Chin Music move on an opposing player in the GIF). Anyway, congratulations Fernando! International soccer fandom pro tip of the week: If someone ever tries to tell you that Brazilian soccer is not corrupt, don’t believe them. Finally, let’s check back in on that whole Boca-River pepper spray fiasco: this week we heard from both coaches and even the actual sprayer! First up is River’s Marcelo Gallardo. The popular “Muñeco” (the Doll) won a Uruguayan League title with my beloved Tricolores in his last season as a player (overcoming a horrific injury and 6 months of rehab to do so), then came back the very next season to win another as a rookie coach (also with Nacional). He was rather straightforward about the incident, calling it an embarrassment for the sport. He wouldn’t even analyze the game itself, because he felt there was no point in the face of something so sad and ridiculous, and ended his remarks by telling the media: “Soccer is dying little by little, and we’re all involved in that. They’re playing with people’s lives.” This guy must be a lot of fun at parties! Anyway, good for you, Muñeco. Don’t ever change. Boca’s Rodolfo “Vasco” Arruabarrena wasn’t as successful in his time coaching Nacional: he came to the Parque Central in March of 2013 and was run out of town on a rail just 9 months later, after a run of disappointing performances and infighting among players. Let’s just say he’s not one of my favorites. 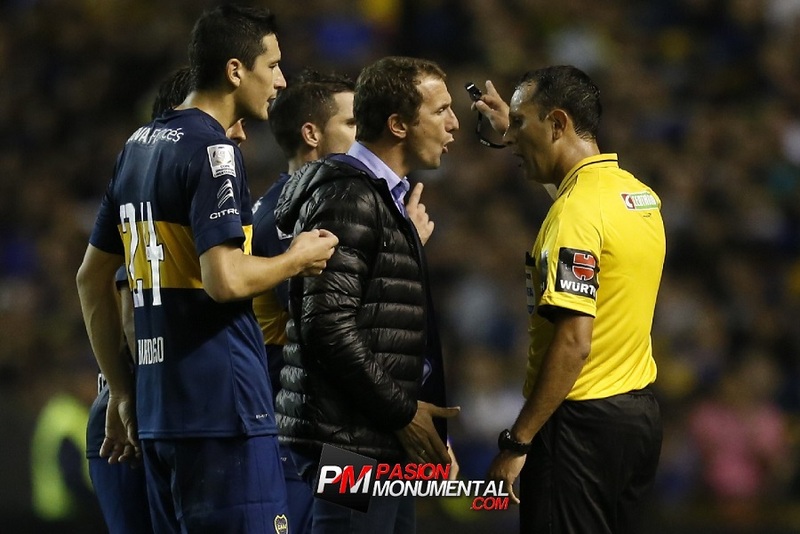 anyway, He took a slightly different approach to the macing, calling out River’s front office for politicizing the issue and complaining about the (ridiculously light) CONMEBOL penalty against Boca as unfair and unjust. He claimed that the series should have been decided on the field, once River’s players had fully recovered. Oh, you mean after they were no longer blind and hideously burned? Gotcha, Vasco. Listen, guy, your team’s fans used chemical agents against rival players and got a 4 game suspension out of it. I think you need to take your punishment with a smile and shut the eff up. The cherry on top of this cayenne pepper sundae, however, was a call made by Adrián “El Panadero” Napolitano to an Argentinian TV program (yes, his nickname is “The Baker,” who knows why). Napolitano is the innocent soul caught on camera pumping the chemical spray into the River Plate entrance tunnel. He called from his hideout to apologize and to let people know he would never plan to do anything so horrific. “I never intended to do this,” he said. “I thought there wouldn’t be any cameras; I didn’t think it would become such a big deal.” First of all, it’s a Libertadores playoff round game between the two biggest clubs in Argentina; what idiot doesn’t think there will be cameras around? And second, did he really not intend to do it? It sounds to me like what he didn’t intend to do was get caught. But now the tables have turned, and it’s the Baker himself who is suffering the burns of fate (ah? ): as he puts is, he’s just a working man who gets up at 4am every morning to support his family, and now he’s desperate because he can’t even leave the house. Well… maybe you should have thought of that before you sneaked a goddamn blowtorch into the stadium. Good luck with all that. And that’s it for me this week, fans. No Nacional goals to celebrate this week, so I’ll leave you with highlights of the unforgettable final game of the 2011 Copa América. SOOOOOOY CELESTEEEEEEEEEEEEE! SOOOOOOY CELESTEEEEEEEEEEEEE! CELESTEEEEEEEEE SOY YOOOOOOOOOOOOOOOOO!